The famous Chilean poet Pablo Neruda once wrote that “I need the sea because it teaches me” – and with every passing year, we’re learning just how right he was. Beyond providing endless inspiration for poets and artists, the oceans are schooling us about everything from the complex mechanics of climate change to potential forms of life on other planets in the solar system. And it’s not just the sea itself – the creatures who live there have even more wisdom to share. At a time when humans are struggling to live in harmony with our natural surroundings, fish have the answer. Specifically, clownfish – the little stripey guys made famous in Finding Nemo. Technically known as anemonefish or Amphiprioninae, they make their home inside sea anemones and are model guests. Not only do they protect, fertilize and tend to their hosts, but scientists have recently discovered that they help churn and aerate them too, making sure they get enough oxygen and fresh seawater to stay healthy, even at night. In return, the poisonous anemones provide shelter and food, in the form of leftovers and even dead tentacles that clownfish can nibble on. There are 30 different species of Amphiprioninae, all co-existing with 10 specific species of anemone. The clownfish from Disney are ocellaris clownfish, and prefer living in the Magnificent Sea Anemone, Giant Carpet Sea Anemone and Merten's Carpet Sea Anemone. Ocellaris are the well-known orange and white ones, but clownfish can also be black, brown, red, pink and yellow – each with their own favorite anemones. Anchored to rocks and coral, sea anemones feed and defend themselves with stinging ‘nematocysts’ on their tentacles, which are deadly to marine life and even, in some species, to humans. The exact mechanism that allows clownfish to swim in and among them unharmed hasn’t been fully pinned down, but its thought clownfish adapt individually to anemones by gradually coating themselves in a layer of mucus that makes them immune to stings. Sea anemones benefit from two mutualistic relationships at once – getting poop and protection from clownfish and energy from the zooxanthellae that live inside them. 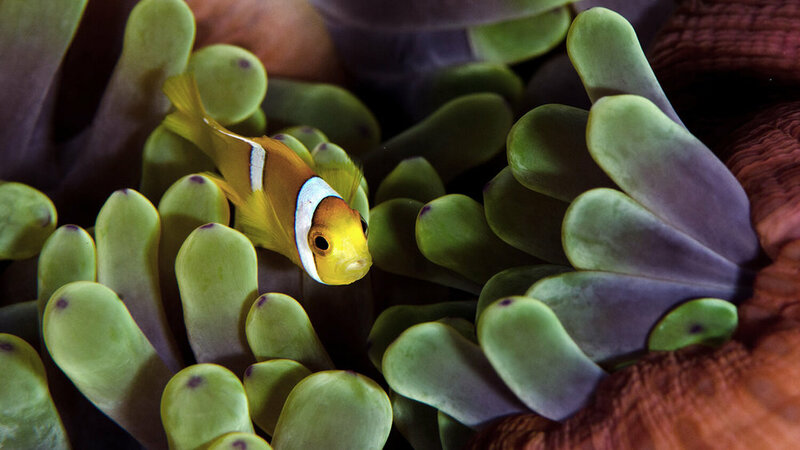 Clownfish are fearlessly territorial about their anemones and will rush out to defend them – even against larger intruders like bemused snorkelers and scuba divers. All clownfish are born male and live in all-male groups led by two larger, sexually-mature fish. The biggest, strongest and most dominant fish is the sole female in the school. If she dies, her mate will transform into a female.